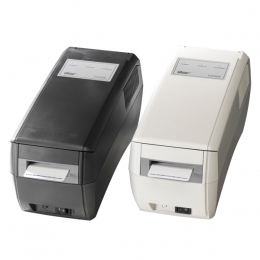 For the professional realisation of plastic cards containing security access and customer loyalty systems with individual layouts, bar codes and magnetic card information, we present the TCP400, a rapid, high-quality direct thermal printer. It prints attractive designs onto special cards, while simultaneously encoding them with magnetic card information. At 30 mm per second and 8 dots/mm 203 dpi, it is not only particularly fast, but also produces monochrome cards in a very sharp quality. In addition to the standard colour choices of black and blue, you may also choose from the broad colour palette of coloured thermal cards. The cards have a re-writable surface, allowing them to be re-written on up to 500 times. At the same time, you have your choice of writing on only one or on all three of the cards tracks. Simply manually load the card into the front of the machine, and seconds later, your finished card is ready for removal. Using the integrated combination interface standard, you connect the printer via serial or USB interface. An Ethernet version is also optionally available.